Celebrities are THE fashion icons for beauty, makeup — and of course, hairstyles. Ciara is no exception. That’s why we’ve got Ciara photo galleries, pictures, and general beauty news on this celeb. Her style is totally inspiring and worth checking out. So if you’re searching for some beauty tips, hairstyle options, and fashion advice, turn to Ciara . She’ll bring your fashion to a whole new place. 1. Right after you wash your hair, divide your hair into sections and apply a de-frizzing product to each section and air dry your curls. 2. Use a paddle brush to smooth back the front of your hair, and slip on a headband. 3. Use smoothing cream to slick back any flyaways in front of the headband, and gently rub the rest over your curls. 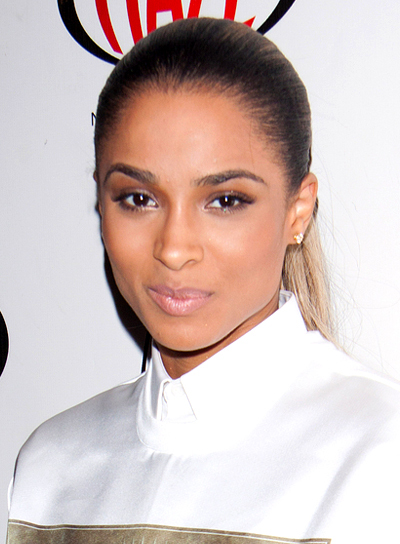 Ciara's straight, sleek style topped off with a casual cap is a great lunch date 'do. Tips to get the look: 1. Start by applying a straightening cream to strands then roughly blow drying. Don't waste time trying to build volume -- you're going to have hat head no matter what. NBD. 2. Once hair is dry, use a straightening iron to smooth small sections. 3. Throw on a slouchy cap and you're set.